Shopping for Rambo Action Figures? High-quality action figure of John Rambo! Taken directly out of the First Blood film. Measures 6 3/4-inches tall, with over 25 points of articulation! 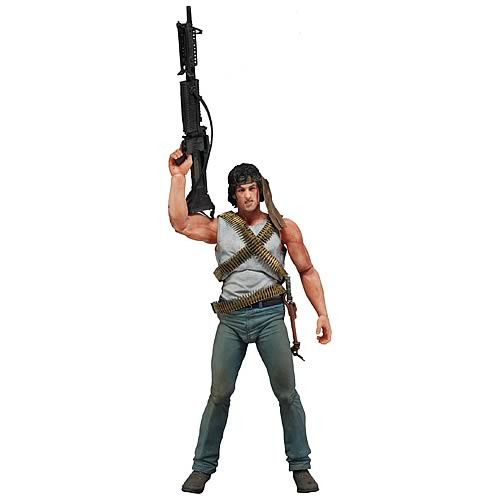 John Rambo comes to life as a high-quality action figure! Directly out of the First Blood movie, this Rambo Series 1 John Rambo First Blood Action Figure features an impressively realistic head sculpt of Sylvester Stallone. Measuring 6 3/4-inches tall, the action figure sports over 25 points of articulation, a survival knife, a machine gun, and more. Rambo fans will love it! Ages 17 and up.